Confederate General Robert E. Lee was once asked what he thought of a fellow officer–one who had made some mean-spirited remarks about him. Lee thought for a moment, then rated him as being very satisfactory. Lee’s response speaks to the virtue of controlling our tongues, even when others don’t and we’re tempted to react with unkind retorts. 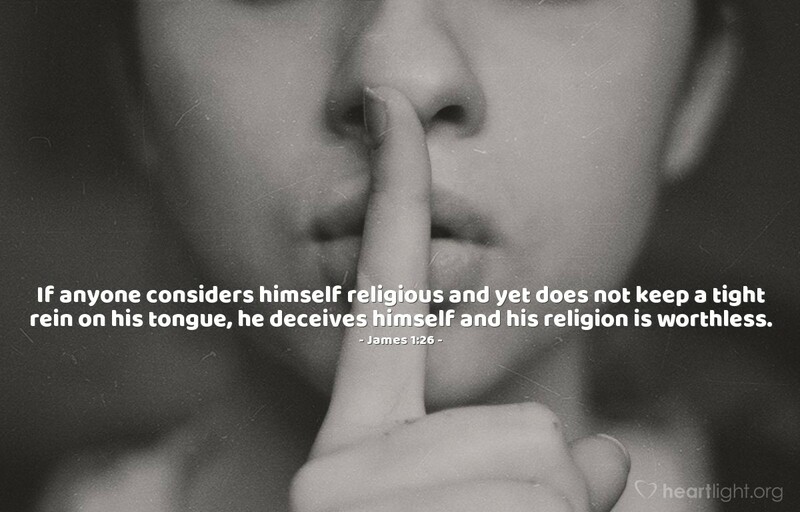 In a short, simple, but powerful verse, the Bible says, “If anyone among you thinks he is religious, and does not bridle his tongue but deceives his own heart, this one’s religion is useless (James 1:26). Often you hear remarks like, “I’m spiritual. But not religious.” “You can be a Christian and not be religious.” “Spirituality does not come from religion.” Or other derogatory remarks indicating that religion is something to be avoided. This is a misunderstanding of what religion is all about and the Biblical usage of the word. People who want to be religiously right work to control their speech. It’s not enough to attend worship, give liberally and “support the work of the church.” Christians concerned about their religion learn to “bridle the tongue.” An out of control tongue that curses, swears, and gossips is the sign of someone whose religion is worthless and useless. It is bogus and barren. Fruitless and futile. There are many ways in which our speech may be incompatible with the religion we profess. The Bible condemns grumbling, griping and complaining. Often called murmuring (Phil 2:14; 1 Cor 10:10). One mark of a Christian is the spirit of gratitude, not grousing over every grievance we experience, whether real or imagined. It’s easy to fall into a habit of bellyaching about our lot in life. Our family. Our friends. The church. Our government. Politicians. And of course, the weather. Let’s learn to bridle the tongue and not constantly carp about our challenges and problems. Another area where it’s easy to lose control is the use of disrespectful and disparaging language. Name-calling, biting barbs, and rude remarks have almost become a national pastime. From the White House to our house and on facebook derogatory discourse is too often displayed. The Bible says “do not repay evil with evil or insult with insult” (1 Pet. 3:9). Failure to bridle the tongue may also be heard in quarrels, outbursts of wrath, racial remarks, arrogant boasting, unfair judging, foolish talking, and coarse jesting. Thanks for the thoughts for my day!